In the saturated market where there are no real barriers to entry, churn is the univocally the number one problem for most SVOD publishers. Find more about Cleeng’s approach on churn management and the available actions on the disposal of SVOD publishers. We are all aware that we are living in times when old patterns of video and television consumption are disrupted. TV content is slowly moving online and this trend is accelerating this year, most notably. A new report based on a survey from LRG states that today, 64% of U.S. households have access to a subscription VOD service. Cord-cutters, cord-nevers and pay TV users that are just experimenting with OTT do not hesitate to try out new services and look for the perfect a-la-carte offering. With the influx of numerous SVOD services across the globe, standing out from the crowd is becoming a real challenge. The providers that manage to build a solid audience that is “tied” to its content and keeps it engaged, will face success without a doubt. Churn is the univocally the number one problem for most SVOD publishers. In the saturated market where there are no real barriers to entry, churn is the univocally the number one problem for most SVOD publishers. 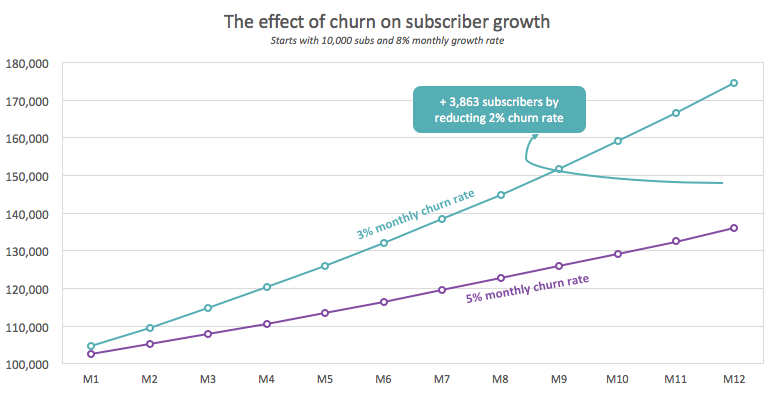 Our data shows an incredible effect of churn on the growth of subscriber numbers. If you start with 10 000 subscribers, just by reducing churn by 2% you can gain 3863 subscribers on yearly basis. When speaking about the importance of churn management – the discussion always comes down to the most important business parameter, the recurring revenue. Decreasing churn translates to a stable revenue stream coming from a satisfied base of existing customers. 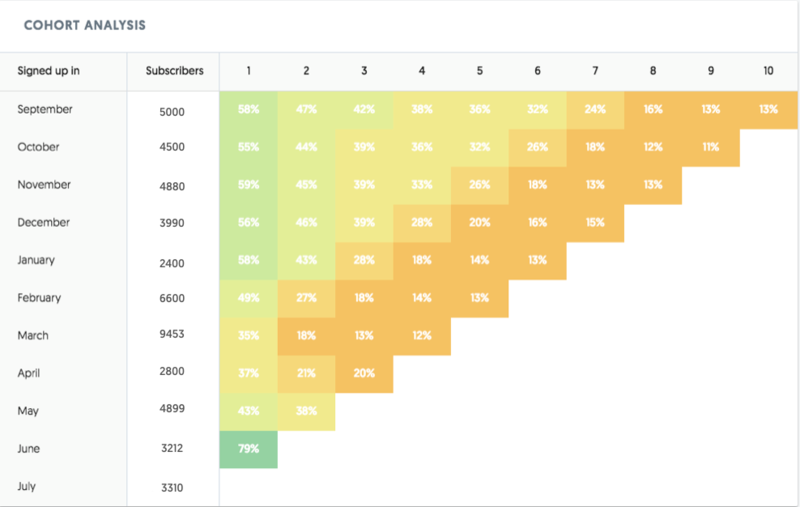 Our chart below shows what churn means to monthly recurring revenue figures. Improving your churn rate from 5% to 3% will translate to an increase of monthly recurring revenues by $220 000. But, how can you predict churn? And what can you do to change it? Having one eye in the future and an ability to affect it differentiates success from failure. In the video industry, no company managed to do accurate predictions for churn. The biggest reason for that is the complexity around gathering and digesting information from many data points (streaming provider, devices, CRMs etc). Satisfaction-related: number of support inquiries, time spent on support, Net Promoter Score (NPS) etc. Finally, what can SVOD providers do to prevent it? The role of technology vendors like Cleeng is to provide the service providers all the data from above and enable them to take quick actions via one platform. Below are the Cleeng platform capabilities and the available actions on the disposal of our SVOD publishers to tackle churn. Engagement-related: “engagement score” and its historical flow, used for prediction. Satisfaction-related: user inquiries management, a rating system that acts as an NPS for users and quality of experience metrics (as platform capabilities) and refunds management, promotion campaigns, coupons (as publisher tools). Our mission is to continually grow our platform’s capabilities and equip our publishers with a full arsenal of tools, so they can focus on what matters: growing subscribers and revenues. Join us and jump on the bandwagon! Stay tuned, we will be releasing more updates about these capabilities with our new publisher dashboard.